1 8:42 Fairly conservative start. Some uphill here. 9 8:45 A little more downhill but on the bike trail now. 11 9:33 Felt like I was running much faster than this. Mentally fatigued. 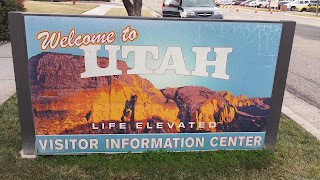 For the fourth year in a row I made the roughly 4 hour journey down to Southern Utah. 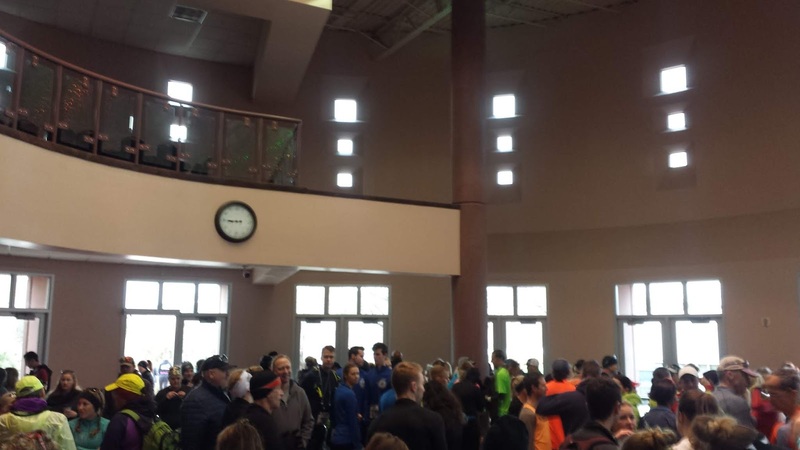 There isn't much in terms of races in Utah in January and any opportunity to get in a race I'll do it. 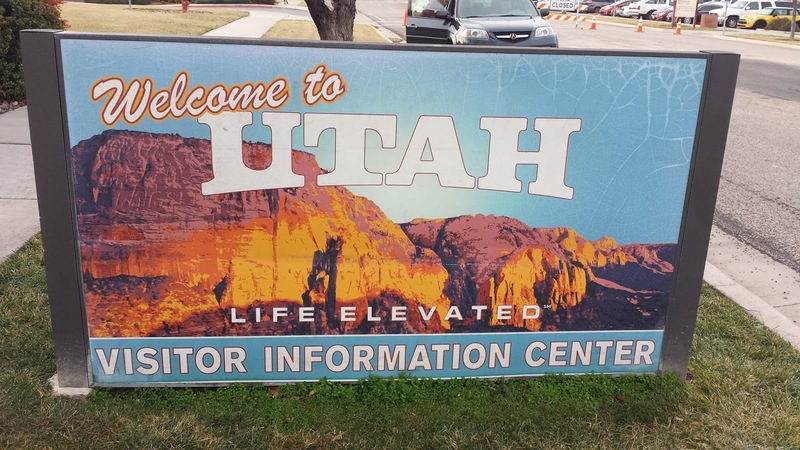 Southern Utah is like a totally different world from the northern part of the state. It is fairly touristy as there are a bunch of national parks in the area and it is also on the way to Las Vegas. It also tends to be about 10 degrees warmer and has cleaner air. I believe the race is also billed as the longest continuous running half marathon in the state. 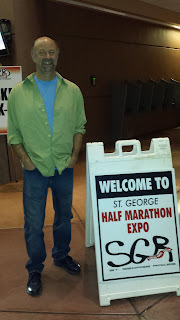 It does not share the same course as the St George Half Marathon but I believe the race organizers are the same. 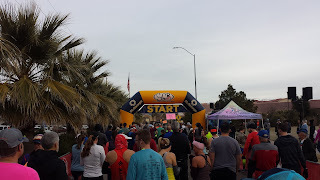 I use the race as an early indicator of my current fitness as well. 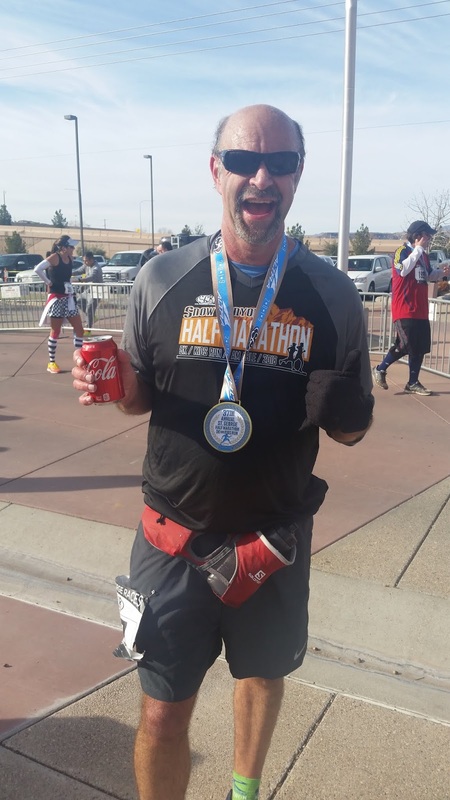 The half marathon course has a mix of up hills and downhills and while I wouldn't call it a super fast course, it is an honest course in terms of elevation gain and loss. My race here is usually a clue as to what I need to work on and where I am succeeding at. I was staying at the Red Lion this time... it is about a mile away. 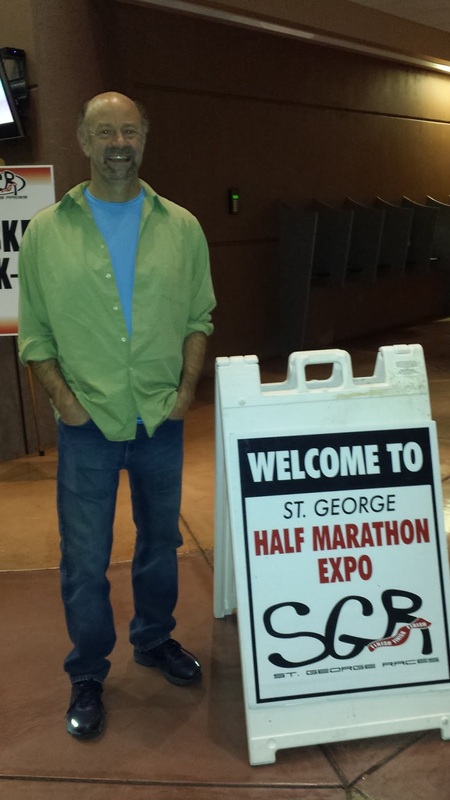 I could've walked to the race site as a bit of a warmup but had Shari drop me off. Pretty low stress... some of the roads were closed but she got me close enough. 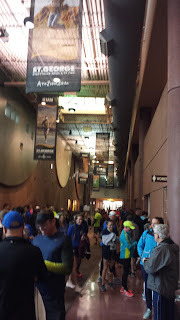 I went to the Dixie Events Center and socialized with some of the runners for about 30 minutes before the race started. They had clean (and plenty) of toilets and the time flew by quickly. The race started at 9... a bit late in my opinion but it makes for a super casual morning. I can sleep in a bit longer and I even manged to eat a little at the free breakfast buffet at my hotel. This wasn't my usual pre-race meal, but had a bit of waffle, oranges and black tea. It worked... I felt like I was sustained throughout the race. The race started at 9 AM and I made my way down hotel row and hung a right to go east towards the residential part of the city. It has some rolling hills and I felt okay. The 1:55 pacer was near me and I figured I'd hang with him and then gain some ground on him. I've run well in the past here and I felt like I could do another 1:53 like last year, or better. I also felt like the 1:55 pacer started out a bit too fast so I was content to let him lead. The first 3 miles are a little bit uphill. I was holding a very steady pace and I was feeling good. Like this good actually be a nice race. A lot of memories were coming up at me as I remembered all the times when I ran this race in the years prior. I was also excited to be running. 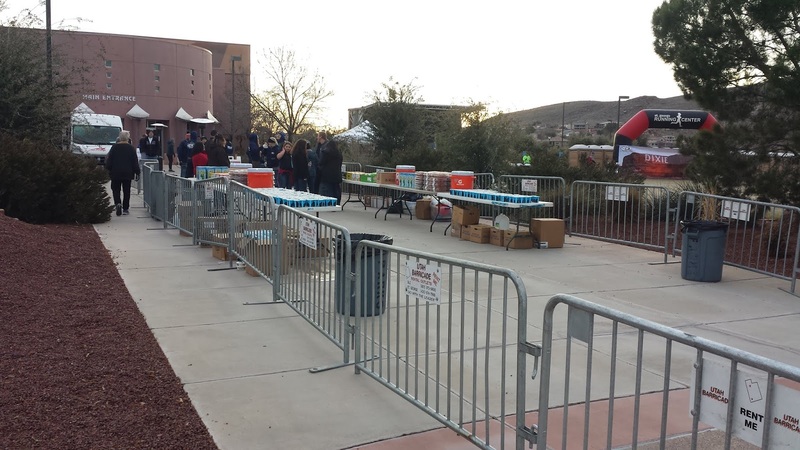 For a half marathon, they have pretty decent crowd support and the volunteers at the aid stations were pumped to see us. I can't say enough good things about this race as the organization is rock solid. After the 5K point, you enter in a subdivision of some pretty nice houses. Some of the morning risers will sit on their lawns and cheer you on as you pass by. I like seeing the little kids as well. My favorite stretch of the course is near the golf course. Unfortunately, here, some of the folks didn't get the memo that there was a race and there is a bit of a traffic jam here as the bulk of the runners pass by. Not fun inhaling diesel fumes but it is fairly short lived. Although the desert smells of sagebrush were a true joy. 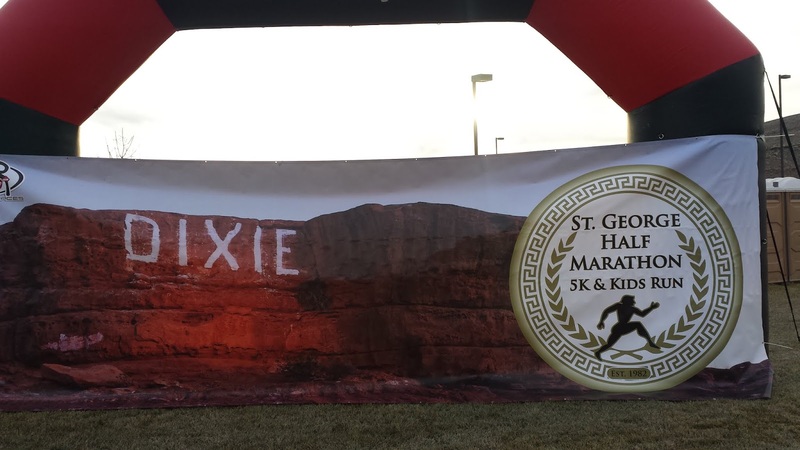 I was really happy with my pace and still felt rock solid. I was hitting the paces I wanted to and I felt good. 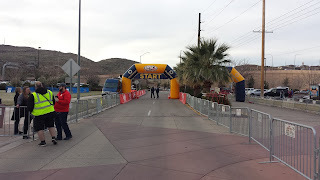 I thought about taking a picture of the course, but wanted to focus on my running. I've been doing some hill repeats and physical therapy-esque and so at the half way point when you are hitting the hills, I didn't exactly feel like I was dying. In fact, I thought I was handling the hills a bit better than I did the year prior (turns out that wasn't entirely the case). Fortunately, the hills end at mile 7.25 and from there you are greeted with a joyous downhill. I wish the rest of the race was like that. I unfortunately was sort of out of gas. I ate a gel in hopes that the caffeine would help. Another favorite part of the run is hitting the bike trail. There is a beautiful view of the city that one will miss from taking the I-15 north. The bike trail has a slight rise here and you can see the Virgin River, the surrounding nature area and the LDS Temple and city in the distance. It is really a beautiful site. Normally there is a bit of ice here but there wasn't any this year. In the past I've had to tread carefully. I was sort of sad to see a 9+ minute mile pass here. I felt like I was running fairly strong. I wasn't in desperation mode in terms of my pace but I knew I was working harder. I sort of figured that might be the case because I haven't done many over half marathon distance training runs. So my endurance was going to be suspect. Also at this point it is a bit mentally tough. You can see the buildings of the finish line across the field, but you have to go east and loop back -- so you clearly have at least another 3.5 miles. I imagined the elite athletes already having finished doing their cool downs while I still had a long 5K to go. I really dug down deep here. But try as I might, I couldn't get below 9 minutes again. There were parts I gained a bit of ground and time, but I couldn't really sustain it. Mentally I wanted to be done and the 1:55 pacer was slowly disappearing from my view. It is a nice area and the bike trail has a similar profile to my local bike trail. I kept breaking down the final stretch -- imagining myself running an easy 3 mile training run. I was happy that my race was largely successful. It wasn't a crash and burn situation like Las Vegas and while it wasn't my best race, it won't go down in the record books as a horrible one for me. I was dismayed, however, to find myself about 2 minutes slower than last year. Ugh, Father Time and the Internet are my worst enemies. I was able to walk off the race fairly quickly. Shari was there and she had a Coke for me. A Coke always settles my stomach and tastes great after a run. Sad to say it isn't exactly health food though. The race finish zone had typical after race stuff. Muffins, bagels, some incredible tasting oranges, cheese sticks and other snacks. They also had sports drink and chocolate milk. The medal is a big one and heavy-duty. 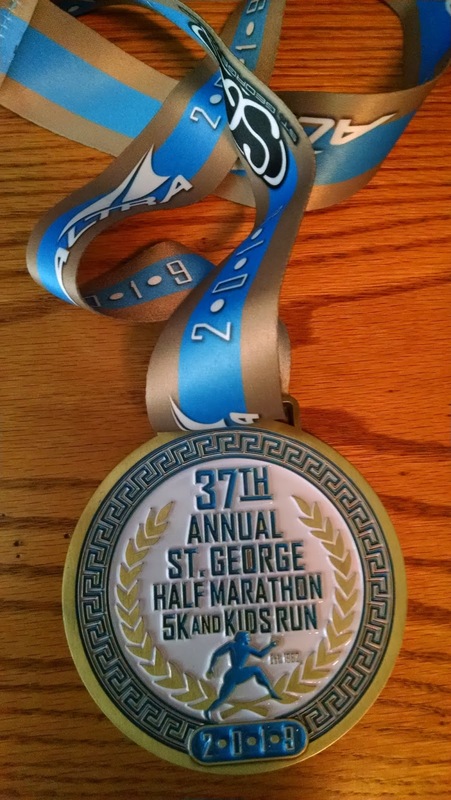 Pretty much the same design as last year's medal, but very nice and clean. The shirt this year was a nice blue one with a zipper front and long-sleeved. Overall the race was well done. 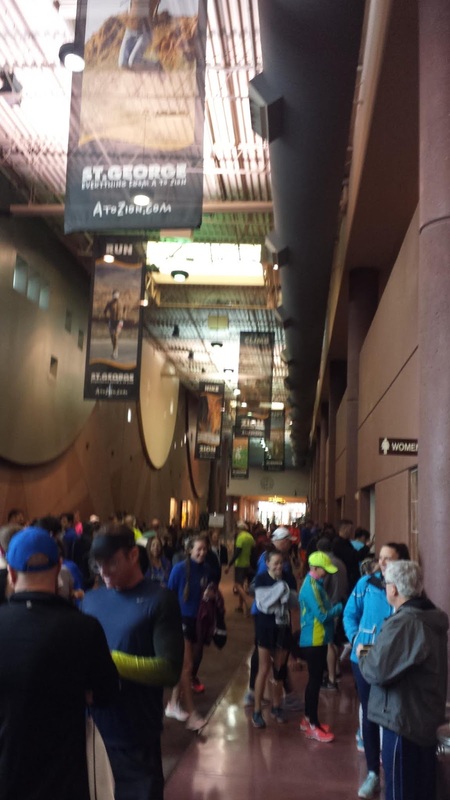 The route was clearly marked were to run and the volunteers were enthusiastic and helpful. One intersection near the top of Brigham Road was unmanned and could've been trouble for cars passing through. Also, I think the mile markers were a little bit off. My Garmin is always hit and miss and the final .1 of a mile to the finish seemed to be an eternity. I paid about $55 for this race. Well worth it and professionally done. 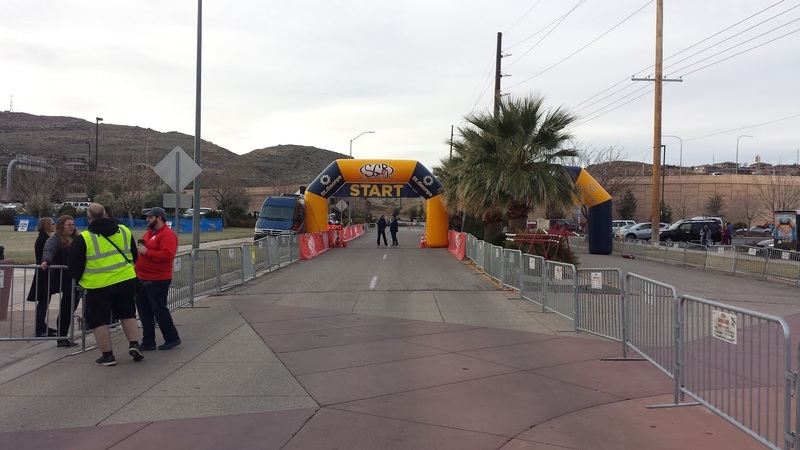 I really enjoy this race as the course is scenic and usually I see a few people I know there. Definitely a good indicator of how my year will go.